Coat 11 Beuys by Protagonist, available at The Line. 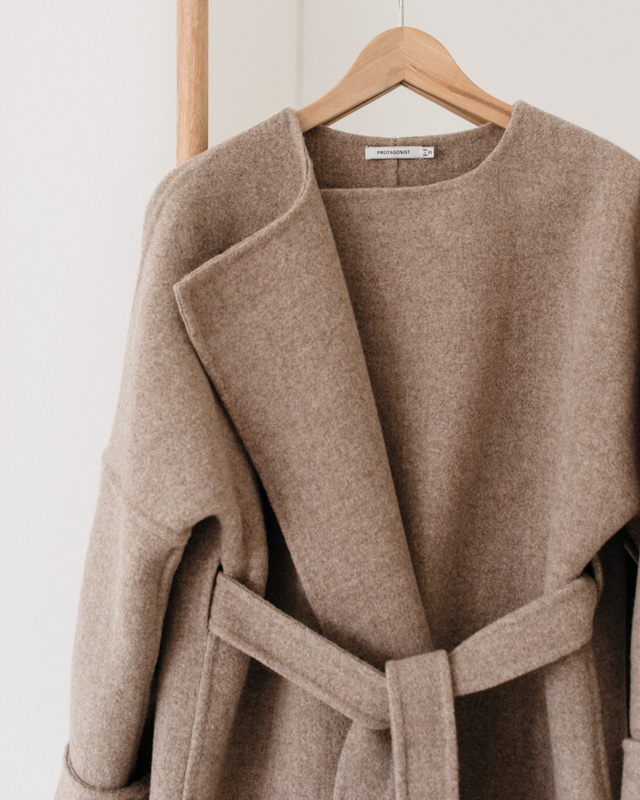 The coat is named after German artist Joseph Beuys (1921–1986), who is known for his felt suits: both for wearing them and for making art out of them. Vivienne Westwood has a point as she talks about fashion being too cheap and most of us buying more clothes than we need. I am not going to play a god here and pretend I knew how the world should be, so I can only relate to this from my personal point of view. I really dislike the feeling of needing a new piece of clothing to look good. I want to practice and feel appreciation towards what I have, not that something is missing. And while I believe you can be anything you dream of being, and you should have anything you dream of having, I also believe that what we most often want is just to feel good and feel admired and feel loved. And when we do not feel that, we easily come up with a fault and a fix. We are so accustomed to thinking that we lack something that we do not even recognize it anymore. Instead, we need things: food, coffee, alcohol, handbags, shoes, cars, or whatever. We eat to feel better. Or we decide not to eat because we think we would be happier if we were slimmer. We improve our looks. We buy new clothes. We go after iconic accessories so that we would look like we are something. Yet the only thing that would fix our real problem requires no money – just a will to focus the mind differently. Be happy with what you have got. Appreciate yourself, who you are and what you do. Tell yourself you are beautiful. Appreciate your body, how well it functions and how beautiful it is. Tell your loved ones that you love them. Enjoy the world around you – the abundance that is everywhere. For heaven's sake, just give me the bag and I will be fine, we often think. Or, give me the bag, and then I am willing to happy with what I’ve got. It is such a funny thing that we consider making ourselves happy without changing the conditions by action such a huge price of our happiness. It requires very little time and no money at all yet we won’t do it. Instead, we climb backwards to the tree and buy something that makes us happy – only to learn that we need to buy something else soon in order to feel the relief again. While I dislike the feeling of needing things I am not immune to it. I just try not to need so many things. Come look into my closet: I need nothing. I only buy clothes because I like to buy and wear beautiful things and I believe the same goes with you. And while I only buy things that are well made out of good materials and that will last for years, I still dream of a more curated wardrobe. I still dream of being more mindful about what I choose. Having less things, less but better. The best piece of clothing I have bought in a long time is this coat by Protagonist. It is a collarless wrap style with no buttons and you can tie the belt in different ways. The unlined double-faced wool structure means there will be no broken lining. When it get really cold, I wear a light down vest underneath. What I most love about the coat is that it does not put my existing wardrobe into shame. No, it multiplies the options. If I still wear it in 2022, I can tell I made a good choice.